Now the ball is in Zac Taylor’s court. 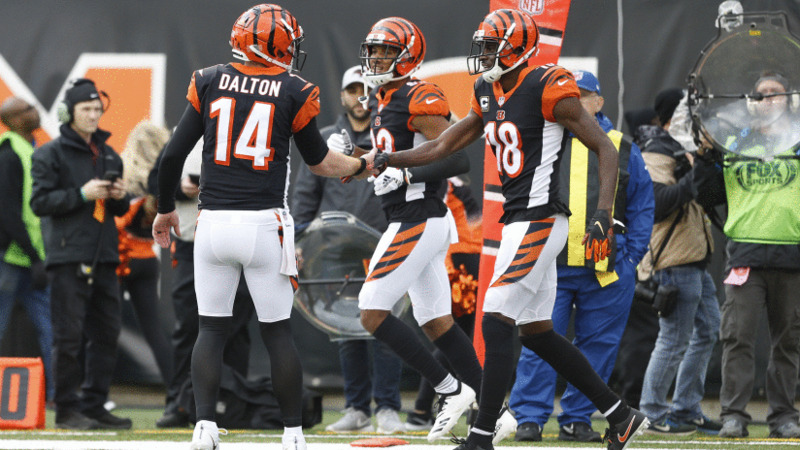 One of the leading reasons he became the Bengals’ 10th head coach back in February is his expertise on the offensive side of the ball with a scheme that scaled the NFL rankings when it came to points and yards. The hire is both a bow to the franchise’s foot print carved out by offensive minds like Paul Brown, Bill Walsh and Sam Wyche, as well as to the current huddle that is waiting for its talent to be tapped with the latest big thing. On the first day of what the Bengals hope is an offensive renaissance Dalton said he’s blessed to have three quarterbacks in the room as coaches, starting with Nebraska’s Taylor, UCLA’s Brian Callahan at offensive coordinator and Alex Van Pelt’s nine seasons backing up Jim Kelly and Drew Bledsoe returning to coach quarterbacks. But in the middle of all this QB talk, the left tackle may have had the most interesting take on the new offense when Cordy Glenn said how much liked the “O-line friendly scheme,” introduced Tuesday by Taylor and new line coach Jim Turner. He had his best years in West Coast schemes crafted by Jay Gruden and Hue Jackson and in the three seasons that he wasn’t in those sets, Ken Zampese and Bill Lazor stirred some of it in the brew. Dalton loves the continuity Taylor brings. He play-booked with Rams head coach Sean McVay after McVay worked under Gruden. And for half a season, Taylor was Lazor’s quarterbacks coach with the Dolphins. Taylor is trying is use all his connections. Rams left tackle Andrew Whitworth, who played for Taylor in Los Angeles and with Dalton in Cincinnati, knows exactly what Glenn means. “I don’t call it so much ‘O-line friendly,’ but (it counters) what I call, ‘OC arrogance,’ Whitworth said. “You don’t have enough originality for getting the ball down the field, so you’re just going to keep sitting back there in the shot gun? If that’s happening, I can pretty much tell you your quarterback and your team is getting killed because defenses nowadays are built to get after the passer and cover and that’s it. After watching Rams quarterback Jared Goff lead the Rams to the most and second most points in the league in the past two seasons, Whitworth thinks Dalton will enjoy the playbook now being installed. Until then, Taylor and Dalton have to take the time to give and take during the art of installation. Working on his third coordinator in the last three calendar years, there isn’t anything Dalton hasn’t seen. No one questions that he’ll end up knowing it like the back of his rehabbed thumb. Which is why Taylor is here and the ball, until May and on-field practices, is in his court and that of his coaches. Rams passing offense is built around 12-15 plays. The scheme itself is more conservative and run focused than you might guess. Where they innovate in the passing game is how many different variations they can run out of the same look. Most players line up in the same spots over and over again but do different things based upon the defense faced. Quarterbacks can audible right up to the snap and receivers can make adjustments post snap, after the defense has reacted. I'm guessing this has something to do with perception the new scheme is easy. I'm hoping our offense is unfriendly. To our opponents. I remember Brian Kelly had (and maybe still does) a similar style offense. It was very option based depending on how the defense lined up. I wonder if the Bengals will target college players from those styles of offenses? Notre Dame, Oklahoma, Clemson, Oklahoma State come to mind. Yep Rams are all about motioning and working different scenarios off of the same basic looks. I remember reading about the Packers back in the Lombardi days... not a lot of variation in plays, just flawless execution. And when the Cowboys were great in the 90s, they didn't have but a few running plays... they just out-executed and out-talented opponents. The more you trick things up, the less it says about the talent you have IMO. We saw what a complex scheme did to the defense under Austin last year... too complicated, guys were hesitating. Same deal, supposedly, with Zampese's offense. Just simplify and execute.